We put the people at the center of politics. Elab Europe is a non-partisan organisation committed to promote civic engagement. We experiment new forms of participatory democracy and nonprofit, evidence-based advocacy in the public interest in Europe and beyond. Through an unconventional mixing and matching of academic research and consultancy in the public interest, we engage in research and advocacy. We blend advances in technology and emerging collaborative approaches to re-invent existing institutions and processes of governance to improve people’s lives. We strive to fill the gap between academic thinking and reality by creating synergies between scholars and policymakers to engage underrepresented citizens, civil society’s organizations and lobby in the public interest. eLab Europe operates as an advisory and research platform. It currently encompasses three major initiatives aimed at educating, experimenting and empowering Europe. 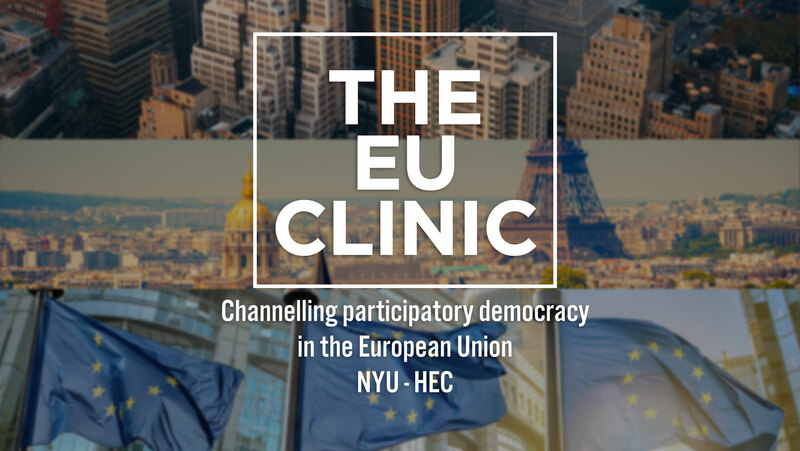 The EU Public Interest Clinic is the result of a partnership between New York University School of Law and HEC Paris. By building upon the American law clinic model and adapting it to the specificities of the EU institutional system, it is the first clinic devoted to experimenting the various channels of participatory democracy existing in the EU. The Clinic focuses especially on the different avenues enabling citizens not only to gain access to the EU decision-making process but also to analyze, critique and support legislative and regulatory proposals. It does so in various policy areas, ranging from public health, environmental, and consumer protection to transparency, interest representation and open data, by working with NGOs, submitting observations in public consultations, filing complaints to EU authorities, intervening in the judicial process, petitioning lawmakers, requesting access to documents or proposing evidence-based innovative solutions to European issues. Selected students from NYU and HEC are able to develop their administrative lawyering skills while lobbying for the European public interest. The Good Lobby is a platform for bringing together NGOs, academics and professionals in the EU to combine the their skills and passions and lobby for the public interest. In contemporary Europe, a civic empowerment gap is emerging. Political power is increasingly distributed unequally between citizens, particularly in relation to EU policymaking, where business interest groups are strong and civil society is weak. To address this problem, The Good Lobby wants to connect people with expertise and knowledge with civil society organisations that need them. Drawing on the concept of sharing economy, The Good Lobby intends to exploit the untapped potential of ordinary citizens, such as academics, professionals and students, to help non-profits discharging their mission. To do so, it will create a network of professionals across different disciplines like lawyers, communication strategists and IT consultants to support civil society organisations in need of professional services. Non-profit organisations lacking economic means and/or expertise will receive pro bono or low bono integrated legal advice, communication strategy plans and research. eLab Europe developed – in co-operation with HEC Paris, Coursera and the French Ministry of Foreign Affairs – Understanding Europe – Why it Matters and What it Can Offer You, the first MOOC devoted to Europe and its decision-making process. Given its inherent complexities, this course aims at popularising the intricacies of the European Union system to promote greater awareness of the opportunities it offers citizens. Ultimately, participants will not only better grasp the applicable framework for any European economic or social activity they engage in, but also be offered the opportunity to participate to the EU. By confronting participants with several current EU policy proposals, they will be able to ‘have a say’ in the EU policymaking process. We want to empower everyone, as a citizen or business operator, to maximize their rights and opportunities in today’s Europe.